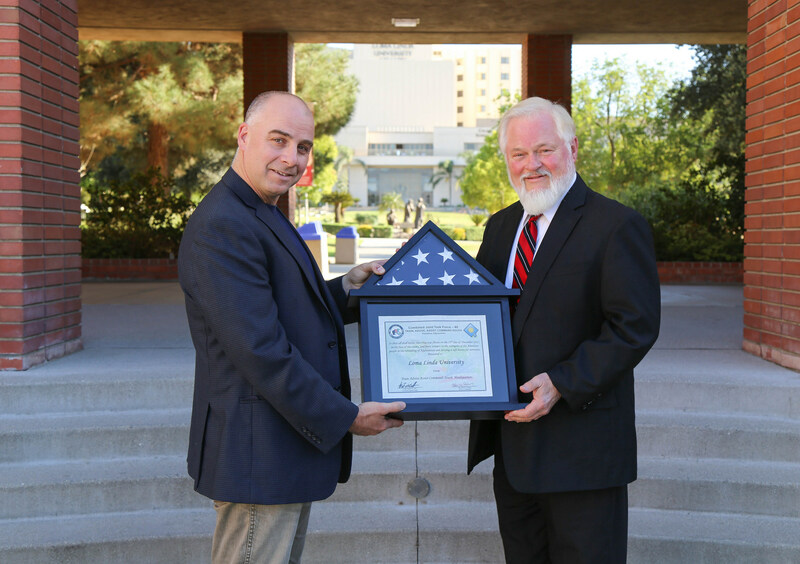 Nathan R. Wall, presents Ronald L. Carter (right), PhD, provost of Loma Linda University with an American flag that was flown on December 25, 2017 in Kandahar, Afghanistan. LOMA LINDA, CA — September 25, 2018 — Nathan R. Wall, PhD, associate professor and director of the graduate program in biochemistry at Loma Linda University School of Medicine, proudly returned to his classroom on Aug. 1 following a nine-month tour in Kandahar, Afghanistan with the California Army National Guard’s 40thInfantry Division in support of Operation Freedom’s Sentinel. Wall deployed for his first overseas mission with the National Guard on October 7, 2017. He served as the Deputy CJ-4 and Chief Medical Operations Officer responsible for the planning, development and direction of logistical operations. This included both medical and non-medical instruction. Wall was part of a team who worked closely with Afghanistan’s military and police forces as they worked toward a more self-sufficient nation. “The ultimate goal was to enable the country’s people the ability to vote and vote in relative safety, and as a result see what can happen when your vote counts,” Wall said. Additionally, Wall assisted in securing clean water sources for use in daily hygiene, medical necessity and hydration for the infantry. The Army veteran of 10 years was well-prepared for his new mission; however, he said leaving his wife, children, colleagues and students for the year was tough. Wall’s wife is no stranger to his active duty and reminded his children that “when one of us serves, we all serve.” His oldest son recently returned home from his service in the Army, while his oldest daughter is deploying to Afghanistan next year. Over the years, Wall has adapted his leadership skills as a soldier into his role as a teacher and vice versa. “The Army has given me the experience to grow as a leader and whether I have failed or succeeded, I continue to push myself further,” Wall said. He’s currently familiarizing himself with academic life again by focusing on new grant applications, building his laboratory and possibly creating a new academic class for his graduate students.